Nasal medications (nose sprays) for allergies are available in a few different classes. Nasal decongestants provide temporary relief from congestion. However, they should not be used for more than 3 to 7 days because nasal congestion can return or get worse once you stop the medication. Since allergic rhinitis usually requires long-term treatment, it's best to talk to your doctor or pharmacist about which medication is right for you. Mast cell stabilizers help with nasal itchiness, sneezing, and runny nose. They work by stopping the action of mast cells, which are thought to be involved in your body's allergic reaction response. They work best when used as a preventative measure, before allergy symptoms start. Otherwise, it may take weeks to feel relief. Side effects may include local irritation, sneezing, stinging, bad taste in the mouth, and nosebleeds. Antihistamines help relieve nasal itchiness, sneezing, and runny nose. They work by stopping the action of histamine, which is a substance in your body that causes an allergic response when you are exposed to an allergen. It is used 2 to 4 times a day. Side effects may include nasal irritation, drowsiness, nosebleeds, dry mouth, and headaches. Anticholinergics are used to relieve a runny nose associated with allergies. They work by blocking the secretion of mucous in the nose. It is used 2 or 3 times a day. Side effects may include headaches, nosebleeds, nasal irritation, dry nose, and sore throat. Corticosteroids are used to help relieve the symptoms of allergic rhinitis, including itching, congestion, runny nose, and sneezing. They work by locally reducing inflammation in the nose that is involved in an allergic reaction. The dosing of corticosteroids is once or twice a day, depending on the medication selected. Side effects of corticosteroids may include burning, stinging, nasal irritation, headaches, nosebleeds, sore throat, changes in taste, and dry mouth. Each person may respond differently to medications and some not everyone experiences the same side effects. If side effects are a concern for you, talk to your doctor about which nasal spray would best suit you. First, gently blow your nose. You may need to prime the nasal spray pump first but spraying it a few times into the air until a fine mist appears. Keep your head upright or tilted slightly forward. Use the "opposite hand to opposite nostril" technique. 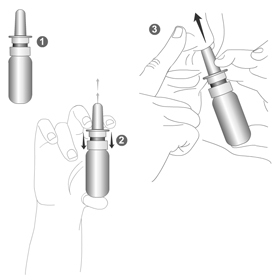 With your right hand, spray the medication into the left nostril toward the outside of the nose. Remember to breathe in deeply through your nose as you pump the spray. Put the cap back on the nasal spray container. People with certain medical conditions should not take some of these nasal medications. To ensure you are taking the most appropriate medication, inform your doctor and pharmacist of any other medications you are taking and of any medical conditions you have.